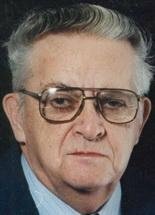 WATERLOO - Herbert H. Bergman, 79, of Waterloo, died Wednesday, Dec. 9, at Covenant Medical Center. He was born Nov. 22, 1930, in Tripoli, son of William and Minnie Bohnsack Bergman. He married Verla M. Boeckmann on Feb. 24, 1957, in Siegel. She preceded him in death. Mr. Bergman worked at Rath Packing Co. until it closed, then at meat packing plants in Cedar Rapids and Marshalltown. He was a U.S. Army veteran, serving from 1954 to 1956. Survived by: a son, Greg (Lisa) of Waterloo; two daughters, Deb Bergman of Waterloo and Lorie (Dan) Schlichte of Austin, Texas; two grandchildren, Meghan and Mitch; three stepgrandchildren, Ethan, Sarah and Wesley; and a sister, Mildred Bonorden of Denver, Iowa. Preceded in death by: his parents; three brothers: Alfred, Wilbert and Vernis; and four sisters, Esther Gaither, Charlotte Burger, Doris Bergman and Alberta Gaede. Services: 10:30 a.m. Tuesday at Zion Evangelical Lutheran Church, with burial in Garden of Memories Cemetery. Public visitation from 4 to 7 p.m. Monday at Locke Funeral Home.